General Description: The Kirk Corner Notched point type is a medium to large sized, triangular shaped blade (sometimes serrated) with a short straight base that is rarely ground but often is slightly smoothed . Serrations can oftentimes be missing due to heavy blade usage (probably as a knife in cutting and sawing activities). The shoulders terminate in sharp barbs that project towards the base. On some specimens the barbs are rounded. The robust serration common to these points often distorts the overall symmetry of the blade contour in the reworking process. The basal edge is thinned by removal of flakes from the bottom of the base. 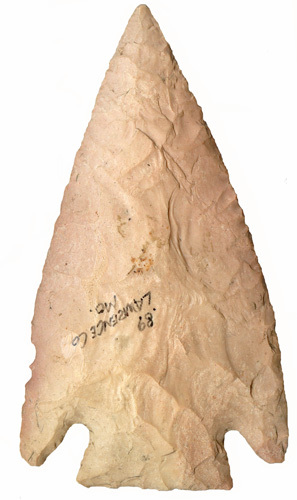 The blade usually exhibits early parallel flaking and is often asymmetrical . The blade edges are usually incurvate or recurvate and can be beveled and / or serrated. The Kirk Corner Notched is found all over the entire Eastern United States and into Texas and Louisiana. The typical dimensions of the Kirk Corner Notched are as follows. The length can range from 32mm to 120mm with the average being 70mm. The width can range from 21mm to 37mm with the average width being 29mm. The thickness ranges from 6mm to 12mm with the average being 8mm in thickness. 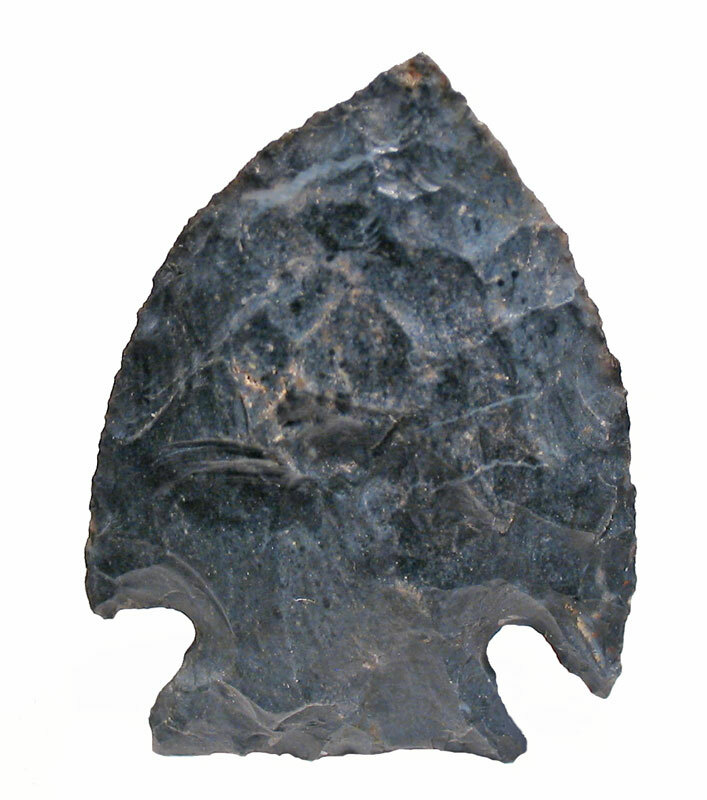 The Kirk Stemmed Point was named by Joffre L. Coe in 1964 for points found at the Hardaway site in North Carolina. Coe initially thought that the point type was two separate types: The Kirk Stemmed and the Kirk Serrated. These two types, are for the most part, only differentiated by the amount of reworking on the blade edges (serrations). 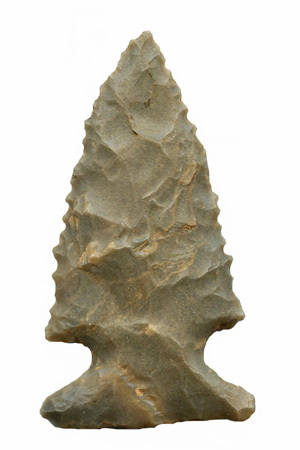 Coe suggested that the original outline of the point was a long dagger-like blade profile with deep serrations and a broad stem. Other Kirk Tradition types blend into this type including the Palmer Corner Notched, Charleston Corner Notched, Amos Corner Notched, Rice Concave Base, and the Kirk Stemmed / Serrated. The Stillwell type as described by Perino may be a variety. The Crawford Creek Notched, the Barbee Corner Notched all appear to be identical to the Kirk Corner Notched type.